To support regional management planning decisions, and to protect human health and safety, we developed a new statistical model that simulates the onset of seasonal ice cover along the shoreline of a US National Park (the Apostle Islands National Lakeshore, or APIS). Our model encodes relationships between different modes of climate variability and regional ice cover from 1972 to 2015, and successfully simulates both the timing of ice onset and the probability that ice cover might form at all in a particular winter season. We simulate both of these endpoints using a novel combination of statistical hazard (or survival) and beta regression models. 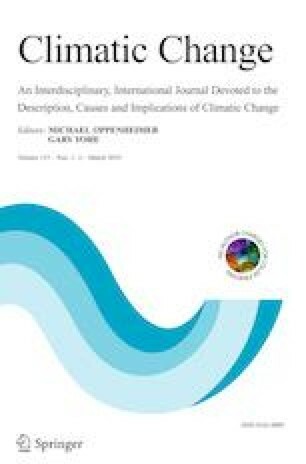 Our analysis of coastal ice cover along the APIS reinforces findings from previous research suggesting that the late 1990s signified a regime shift in climate conditions across North America. Before this period, coastal ice cover conditions at the APIS were often suitable for pedestrian access, while after this period coastal ice cover at the APIS has been highly variable. Our new model accommodates this regime shift, and provides a stepping stone towards a broad range of applications of similar models for supporting regional management decisions in light of evolving climate conditions. The online version of this article ( https://doi.org/10.1007/s10584-019-02400-1) contains supplementary material, which is available to authorized users. Anne Clites, Craig Stow, Song Qian, and Jia Wang provided valuable comments on the technical aspects of the manuscript and use of ice cover data. Kaye LaFond, Becky Bolinger, Lacey Mason, and Nicole Rice provided data management, editorial, and graphical support. The authors thank Robert Krumenaker (Superintendent), David Cooper, and Neil Howk from the APIS for helpful discussions related to this project. This is NOAA-GLERL contribution number 1914. Funding for this study was provided by the University of Michigan, the Great Lakes Integrated Science and Assessment (GLISA) center, and NOAA-GLERL.